I have put together a killer deal for a Complete Kit. Each Kit has a cook pot, an everlasting 0.10mm-thick titanium windscreen, and choice of burner and pot support options. All are ultralight. 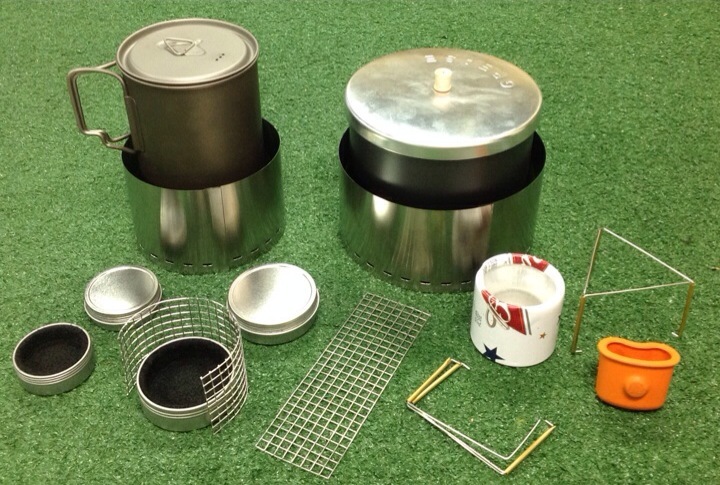 The Aluminum (Al) Kit features a 4-cup capacity aluminum pot. The aluminum lid has a nice Spectra cord lifter for easy handling (not pictured). This pot and lid are amazingly light and you'll find that heat from your burner transfers to the pot very efficiently. I recommend either the DualFuel XL or Bottlestove.com burner with this Kit. If you like to drink a hot beverage right out of your pot, add a Snow Peak "Hot Lips" to your order. Titanium Kits are no longer available from me. BUT, if you get your own Toaks 750cc pot, just add one of my small windscreens, a DualFuel burner, and a mesh pot support to end up with the same Kit you see featured in the video. Check out Sectionhiker's review. Pot height with either a TriPod or stainless mesh pot support is set for optimum heat transfer to your pot. The TriPod has a new improved design not shown in the video. Go HERE to check it out. The DualFuel XL burner holds up to to 1.5 oz of fuel. Under typical conditions, it will bring 2 cups of water to a rolling boil with 0.5-0.7 oz of fuel. It has a screw-top lid that can also serve as a handy tray for an Esbit tab. The Bottlestove.com burner is very durable and has a generous fuel capacity. It will bring 2 cups of water to a rolling boil with 0.8-1.0 oz of fuel. It needs no additional pot support. Check out the Bottlestove Demo for how it is primed to bloom before you set your pot on top. USA shipping will be added to your order. If you order other things from the site, I will rebate any excess shipping costs that you are charged back to you. Shipping outside the USA has extra costs. Go to my Global Shipping Page to add this payment.